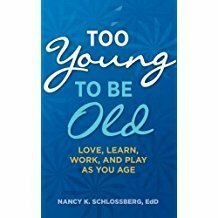 Too Young To Be Old: Love, Learn, Work, and Play as You Age. 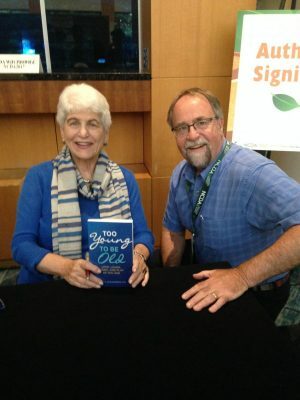 By Nancy Schlossberg, a friend to the career counseling world who is now in her 80’s and still writing, thinking, and sharing her thoughts on transitions. Much of this book is her personal journey in her 3rd Age and 100’s of interviews with others going through this new developmental stage of life. She addresses the biases of age and gives suggestions on how to deal with our own perceptions of age bias as well as what we might do to address it when we hear it. Understanding all the various transitions people go through is a big part of this book, from the transition of leaving F.T. work, to moving, changing relationships, and more. The key point of any transition is how your roles, relationships, routines, and assumptions about yourself change. Using her 4 S’s of breaking down the transition to identify weaknesses and strengths is covered throughout her book. Situation: What kind of impact is the actual situation? Were you ready for it? Is the timing good or bad? Self: how resilient are you? Are you an optimist? or a pessimist? Supports: What kind of support do you have? Friends? Family? Your community? Strategy: Do you have the ability and / or past experiences to actually strategize and come up with possible solutions to a situation? Each of her 4 S’s helps you see the parts and pieces of a transition and which are you may need to work on in order to get through it. I loved how she devoted much of the book to what can you do about it? How do you create the new you? She starts with a chapter called “Keep Your Dance Card Full” followed by “Go For Romance (If You Want To), and “Create Your Own Happiness: Your Path to Positive Aging”. Great advice and research to support her advice throughout. Another thing I really liked in this book is her “To Do List” at the end of each chapter. I highly recommend this book if you are a boomer or recently retired from full time employment as a way to look at the opportunities this time in your life has for you. Are you interested in learning more about transitions and or transition theory? Check out my blogs on this topic here. I also offer a 4 week (soon to be 5 week) discussion-based online seminar on this topic. Learn more. Nancy and I at the National Career Development Association conference June 2017. I was lucky enough to be her contact and driver for the conference.